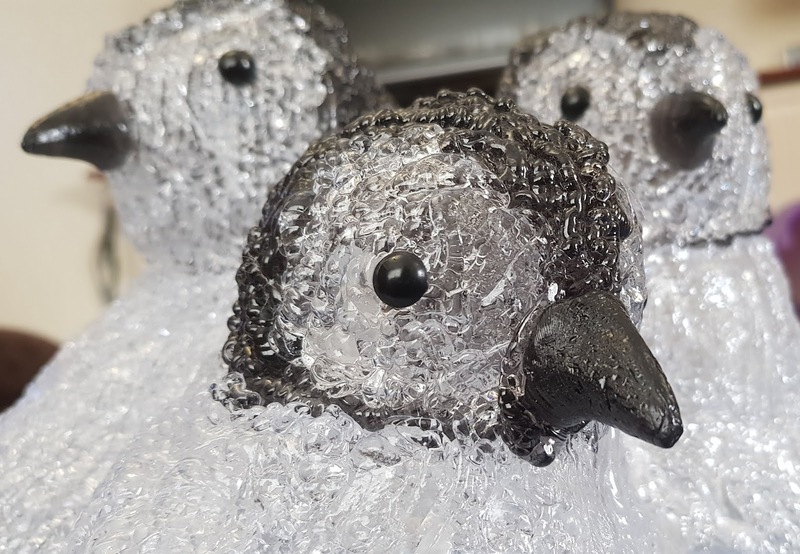 Outdoor Acrylic Penguin Family (£33.99) was chosen by our 10 year old. In fact his wishlist had 6 items and 5 of them were penguin lights - I think he's trying to tell us something! Suitable for indoors or outside and mains powered with the plug and transformer included. The cord is just over 1m long, which is long enough to be helpful for most jobs. 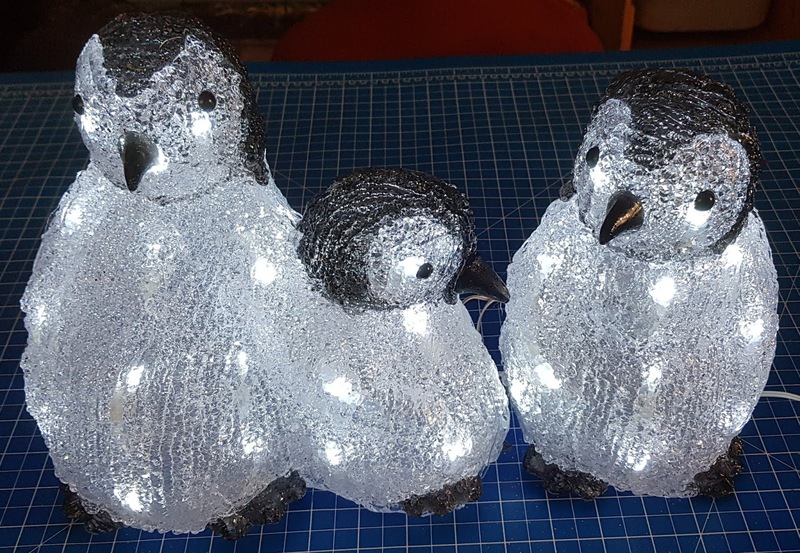 There are 48 LED's in this set and the tallest penguin is 9 inches tall. 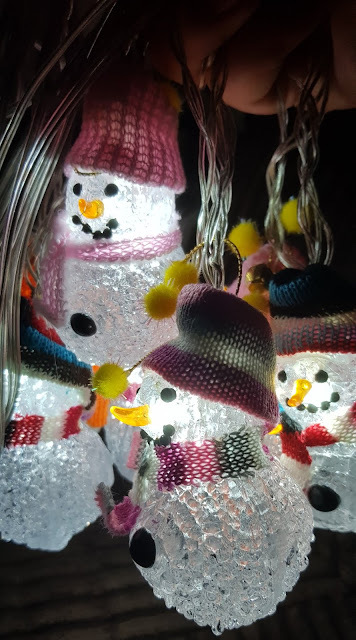 The Set of 8 Indoor Snowmen Light Chain (£19.99) was both our boys' choice and is very sweet. White LED bulbs to save energy and they won't become warm, and with mains power - the plug and adapter are included. 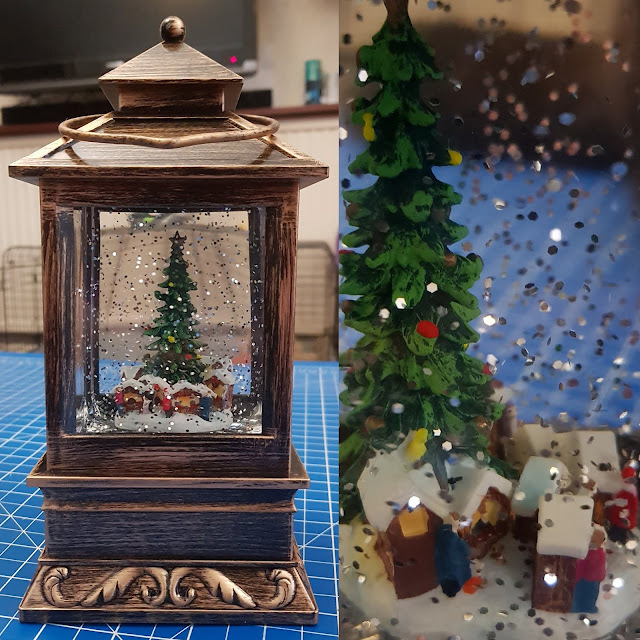 The Christmas Market Mini Water Lantern (£17.99) was chosen by my partner and myself. We're very keen on snowglobes and this 9" tall water lantern will look great on the window ledge or table. Powered by 3 x C Batteries, the warm white LEDs along with the water give a really warm glow to the room. 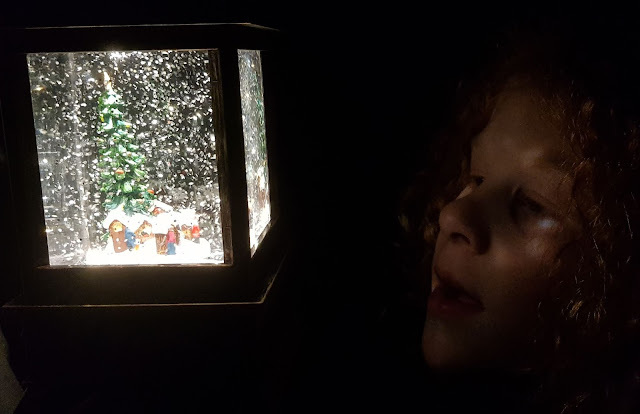 The power also makes the snow fall slowly and evenly through the lantern. It's really calming and pretty to watch. A lot heavier than you'd expect because of the volume of water and those ginormous batteries, From any side the buildings are finished and it looks gorgeous. We're especially pleased with this. 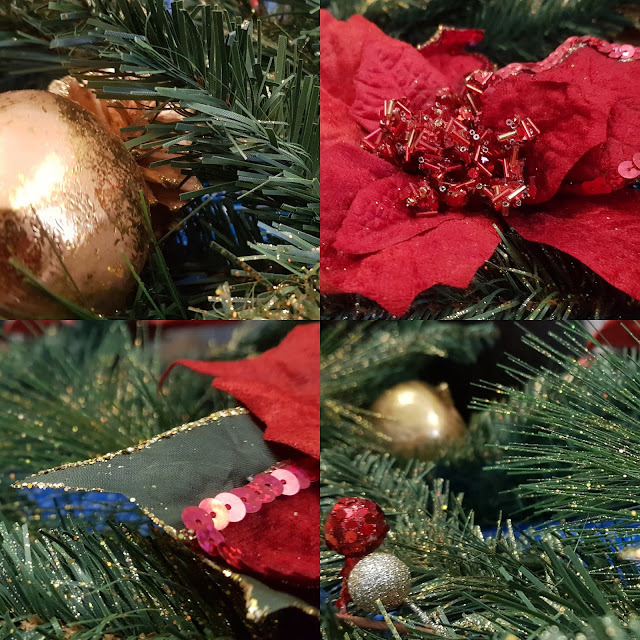 Premier Poinsettia Garland Red & Gold (£29.99) was chosen by my partner specifically to replace our old, tired swag. It is suitable for outdoors, although avoid the worst of the weather to keep it looking nicer for longer. At 1.8m long (almost 6ft), this is a really beautiful wired garland which is much nicer and better made than the image online suggests. We're really pleased with it and it'll be gorgeous draped along the edge of our mantlepiece. Gardensite have offered one of my readers the same big bundle of 5 items that we were sent, worth over £100. Entry to the giveaway is by the Gleam form below and it is open to UK entrants only. If you are new to Gleam there's a link to advice on my Giveaways page, along with my other UK giveaways. No entry is mandatory, but each extra task performed will earn extra entries into the random draw. Full terms and conditions are at the bottom of the Gleam form. 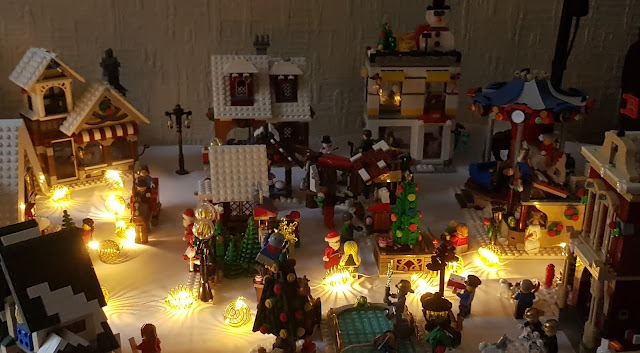 Entries will close at midnight FRIDAY 14th December in order that we can do our best to get this to you asap and certainly in time to put it up before Christmas! If I cannot get a response from the winner within 4 days we reserve the right to draw another as this is a time-sensitive prize. 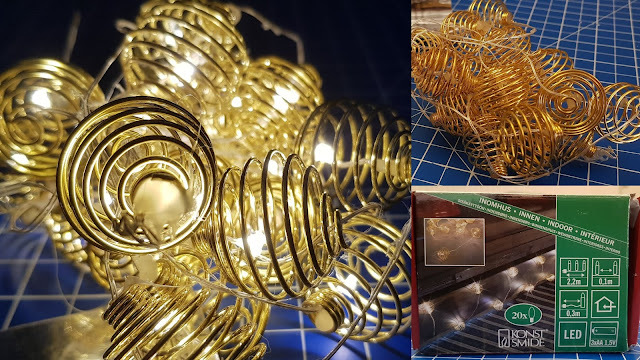 We were sent our bundle in return for administering this giveaway and reviewing the products. The Strangest Christmas decoration I've ever seen is a baby Jesus that looked like a decapitated thumb! A mooning Father Christmas in a garden once. Not the most tasteful of decorations! A Stan Laurel statue in somebodies garden with a sprig of mistletoe hung over his head! I was a the ideal home show and I saw a toilet shaped Xmas decoration! I can’t think of any I have seen but sure I must of seen some random thing that is totally unrelated. A Father Christmas with a wobbly head that almost looked like it was hanging off! I did see a post the other day where someone had spotted an Elvis Christmas display, but it was in the USA. Primark doing Burgers as Xmas decorations... it’s just weird! The christmas tree that was put up in our town centre in 2013. It was actually branded the worst in the country! My mum's friends 'gifted' us their very old outdoor decorations. 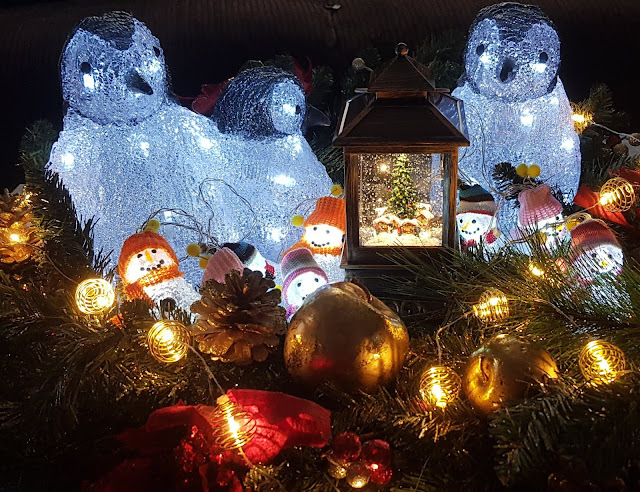 We now have a santa and reindeer in the garden but half of the reindeer is missing and santa looks a bit more like the child catcher than santa but it gives our neighbours a laugh. Mother Christmas in a bikini, oh dear, it didn't leave much to the imagination! We were gifted a santa flag some years ago but it is so big there is nowhere to display it! The children's first efforts at cardboard decorations. I still have no idea what they are but we hung them on the tree every year, anyway. Probably The Grinch decrations I have , they are a bit strange.